One of the great things about kitchen chairs with drop in seats, aside from the extra cushion for the fanny, is how easy it is to update your look with minimum fabric and effort. We last updated our upholstery eleven years ago, so it was more than time (as you can see by the grimy before photos) to reupholster these kitchen chairs. I am a huge fan of a bargain. So, when it came time to update our kitchen chairs this time around, I turned to my favorite online classifieds, which being here in Utah, is KSL. Other people might use Craig's List, Ebay, or even Etsy. I was in luck! I found all of these fabrics and two others, totaling eight yards of upholstery fabric for $10. That is a killer deal! 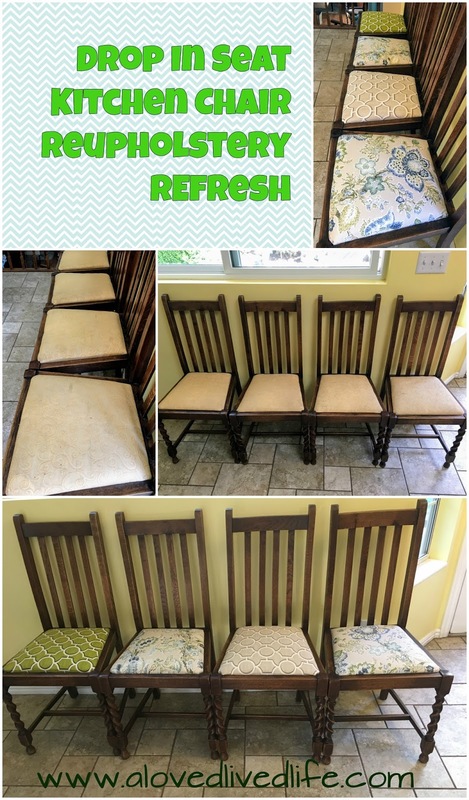 I used some for reupholstering these seats and I have some in reserve for throw pillows and a foam cover when we install our new kitchen bench (coming soon to this blog near you!). If you've never done any upholstery work, then drop in seats is a good place to start. All you need is some fabric, a staple gun, some scissors, hammer, and upholstery fabric. If you need to add more padding, then you'll need some batting and you might want to remove the old fabric, in which case you will need a flat head screw driver and needle nose pliers, but removing the old fabric isn't always necessary. Basically, all you need to do is cut an appropriately sized square of fabric, wrap the fabric over the seat, and staple to the bottom maintaining some tension on the fabric. Hammer in any staples that don't fully seat. For detailed and more precise instructions on how to reupholster a drop in seat, check out this blog post.